Guacamelee! 's Juan joins the fray. Brawlout, the “party platform fighter” currently available for PC (Steam), will launch digitally for Switch on December 19, and for PlayStation 4 and Xbox One in early 2018, developer Angry Mob Games announced. It will cost $19.99. 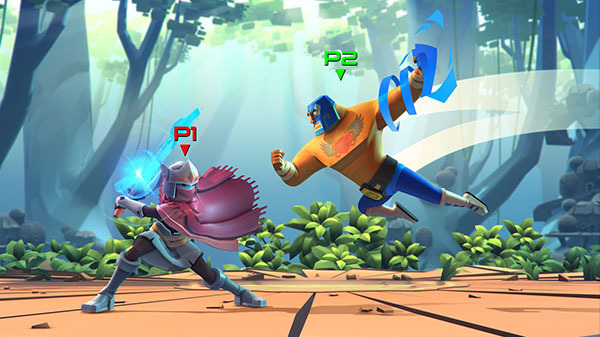 Brawlout packs a punch with couch and online play modes, blending platform fighter mechanics and traditional fighting game play into a stylish and fluid battle royale. Rather than slow-paced defensive battles, Brawlout goes all-out with the lightning-fast aerobatics which platform fighters are famous for. With wavedashing, a free-form combat system, and the Rage Meter at the player’s disposal, each battle should be a combo-bonanza! There are currently six original characters and two popular indie characters to choose from that allow for varied play styles. From grappling to long range weapon options, there is a character for all fighting game aficionados. As well as cosmetic skins, each original Brawlout character has up to three Variants; alt versions of the character with different stats, outfits and even new moves. With these Variants, Brawlout’s cast numbers 18 individual fighters. Find the fighter and Variant that’s right for you and tear it up on the battlefield. Whether players are looking for a casual couch experience with friends, or to challenge pros in worldwide online tournaments, Brawlout caters to anyone looking to create a little chaos. Choose from six original characters, each with their own fighting style — and their Variants to make a grand total of 16 original fighters. Try your hand at the new additions of Juan from Guacamelee! and the Hyper Light Drifter from the indie hit of the same name, bringing the total cast to 18 fighters with more incoming. Host up to four players in online and local battles. Choose from a number of battle modes including timed, stock or team matches. AI opponents are also available if you want to practice your team combos with a friend, or if you need to fill out a free for all. Train with Advanced Tutorials or go in for yourself in challenging Arcade Towers. Fuel your Rage Meter to power up for hard-hitting special attacks, and tap into Rage Mode to swing the match in your favor.